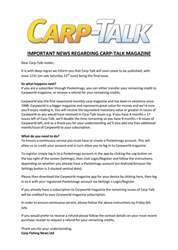 This week’s issue of Carp-Talk (issue 1049) is available to download now. This week’s catches are topped by the remarkable Two-Tone of Grenville’s Lake in Cambridgeshire, which set a new lake record by coming out at 56¼lb to Spencer Powell. 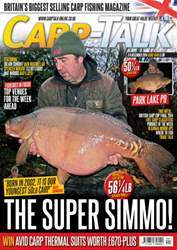 We look back at the British Carp Cup final, and Julian Cundiff explains his five major steps to cold-water success. Elliott Gray reveals why he prefers a Withy Pool rig over a hinged stiff in winter, and Mat Woods takes a look at rigs to use this winter. Spencer Wright looks back at a successful winter campaign, and Baz Lloyd concludes his review of a successful year on Linch Hill’s Stoneacre Lake. 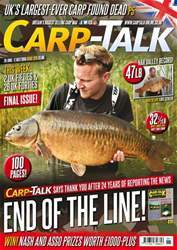 We take a look at some venues worth considering for your next season, and products from Avid, CarpBaitUK, Gardner, Korum, Solar and Venture go under the spotlight in ‘Trade Talk’. 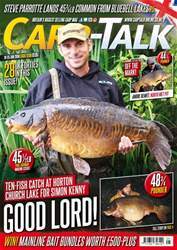 The Fox-Mainline Carp Angler of the Year competition continues, the Nash monthly winners are announced, and there is £670-plus worth of Avid products to give away.